Repurposing old items into things you can use again and again is an easy way to be kind to the planet while getting more mileage out of your stuff, too. From crafting gift bags from empty cereal boxes to recycling old books into an organizer, scope out these seven upcycled Earth Day projects. 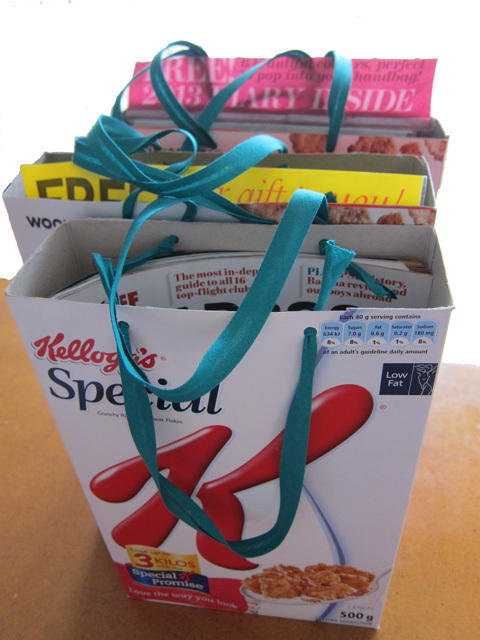 Take your gift giving to another level when you present presents in this Earth Day-worthy upcycled cereal box gift bags idea from SustainableMags. First, use scissors to cut the top flaps of your empty cereal box and discard the scraps. Next, punch 2 holes parallel to one another on each of the long sides of your cereal box at least a half inch below the top. You should have 4 holes total. Finally, run your recycled ribbon through the 2 holes on each of the long sides, forming handles by knotting the ribbon on the inside of the cereal box and your Earth Day project is ready to fill with your favorite gifts! 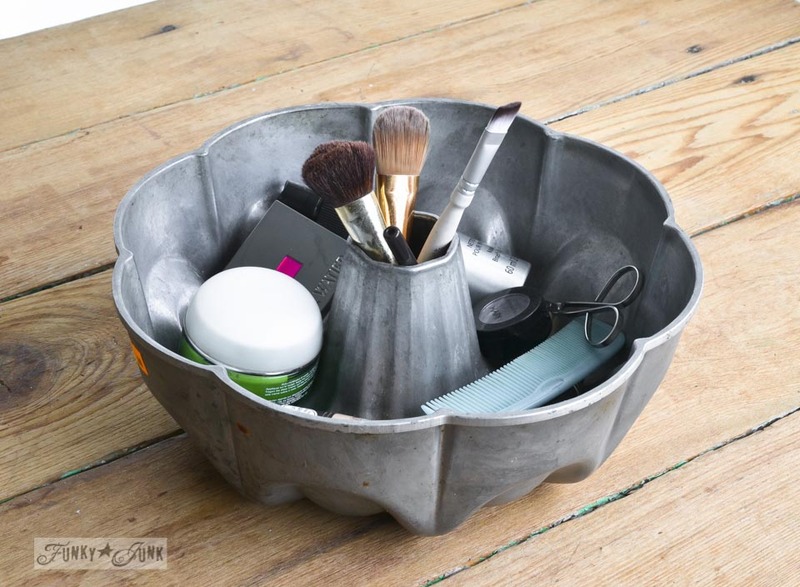 Cluttered bathrooms — and overflowing landfills — can be a thing of the past when you do your part to clean up your counter top chaos with Funky Junk Interiors' cake pan makeup organizing idea! First, lay your Bundt pan with the open side face up. Then, stand your makeup brushes on their ends in the pan's open center. Finally, fill the Bundt pan's main cavity with your makeup and other beauty products to keep your counter clutter-free! Instead of retiring your retro straw dispenser, try giving it new life with this pencil holder idea from Mrs. Lirette's Learning Detectives! First, remove straws and set aside. 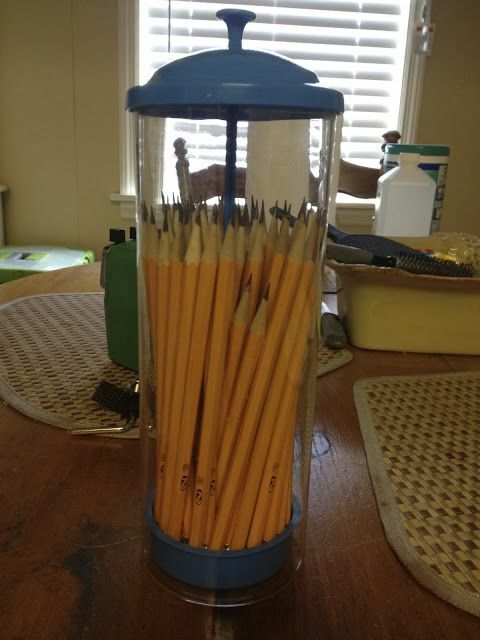 Then, place sharpened pencils, point side up in the upcycled straw dispenser and your writing sticks will be at arm's reach for you and your kiddos at all times! 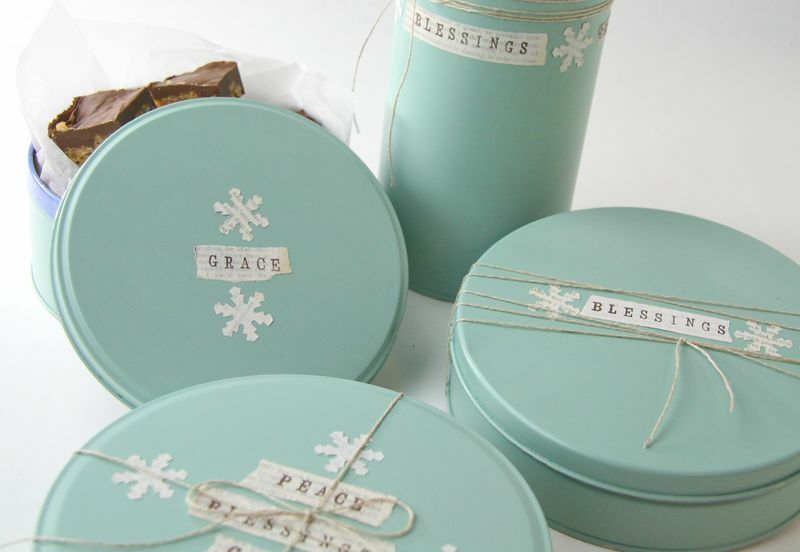 Put an end to tossing empty cookie and Christmas tins when you repurpose them with Cynthia Schaffer's tutorial for upcycled tins! First, gather random tins and lightly sand. Next spray the tins with several thin coats of Krylon indoor/outdoor paint... while the top is still on!!! Then give a few pages of old book text a wash of Gesso. Now stamp words on the text and tear out and punch snowflakes out from the Gessoed text. Adhere both onto the tin tops using just white glue. Finally, load your tins up with your family's favorite treat and tie up the tin with a little hemp. 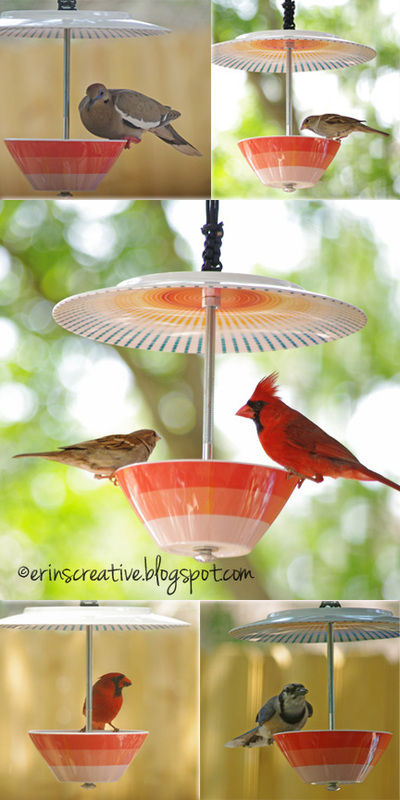 Give birds a pretty place to perch and eat while adding a splash of color to your yard with Erin's Creative's DIY bird feeder made from upcycled plates and bowls for Earth Day! First, drill a hole in the center of your plate and bowl. For plastic dishes, place a block of scrap wood directly under where you are drilling to minimize blowouts. Then begin assembling your Earth Day bird feeder by placing a washer on your bolt and then bring your bolt up through the bottom part of your bowl. Next, to stop it from being wobbly, sandwich the washers around the bowl with glue. The order goes, washer, glue, bowl, glue, washer. Now you will take a nut and thread it a few inches down. Your plate will sit directly on top of this nut. Then place your plate on the nut, then thread another nut so that the plate sits between the two. Hand tighten them so your plate doesn't move, but not so hard that you crack the plate. Next place another washer and another nut on your bolt. This step is only necessary if you used a carriage bolt. If you found a large eye bolt, your assembly will be in reverse. Then, cut yourself 2 pieces of nylon cord about 2 feet long each to assemble your lanyard loop. To create a lanyard, first tie a simple overhand knot (the first knot you make when tying a shoe) with each piece of cord to the back of the plate under the washer. Make sure the knot is around the middle of the cord. Then you start doing a crown sinnet knot over the top of the washer, continuing to braid until you've created a lanyard-style loop. Now burn the ends of your nylon cord to ensure the knot doesn't unravel or come untied. Finally, fill your bowl with bird seed, hang it outside and wait to see what feathery friends come to visit! 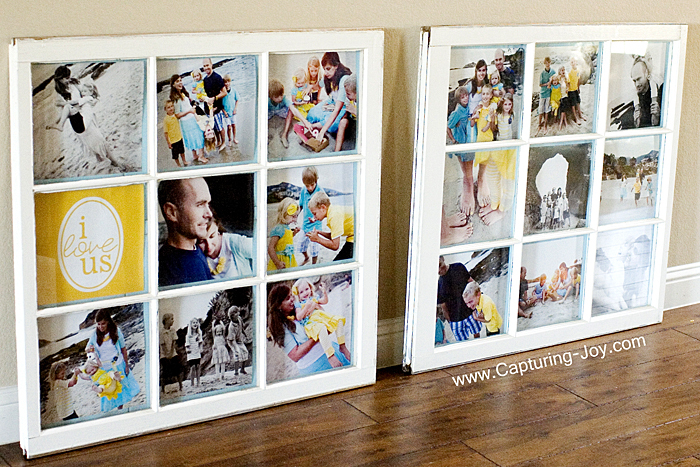 Do a little Earth Day upcycling and add a little charm to your abode with Kristen Duke Photography's tutorial for turning an old window panel into a picture frame! Put clutter in its place while giving old books a new lease on life when you create your own mail organizer like bec4-beyondthepicketfence.blogspot.com! First, start with a piece of wood approximately 10 x 22 inches and paint it gray. Then find 3 great old book covers, ones that are maybe a bit larger. Measure and note the width of the books. Next, add some scrapbook metal label holders to the front of the book by marking the holders, drilling the holes and securing with the mini brads provided. Now cut some fabric trapezoids about an inch longer than the width. Double the fabric so there would be a nice fold on the top edge. Then secure the fabric to one side of the book cover using hot glue. Do not glue the fabric to the binding yet; securing the other side can be a bit tricky, but not too bad. Put the glue on the fabric and then bring the cover up to it. You have to do it one side at a time — sticking your hand in the book helps. Then glue the end to the book binding. Next secure the books to the board with screws, screwed in at an angle and add in your labels. Finally, attach your upcycled Earth Day mail organizer to the wall and watch your clutter come to order!